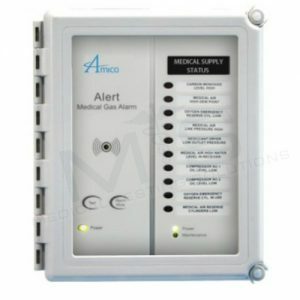 The Digital LCD Area Alarm system shall be an Amico Alert-4 series, complete with a five-year warranty. 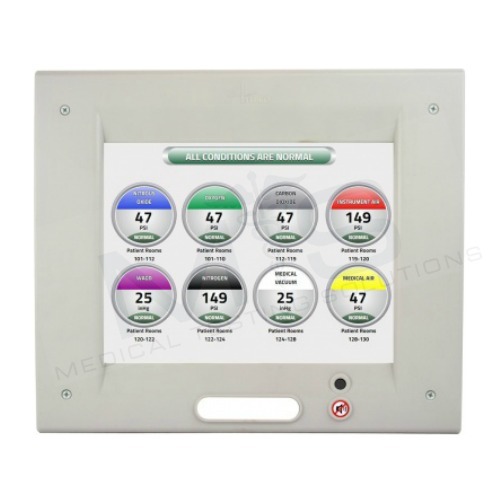 The LCD alarm shall be microprocessor based with a 10″ (25.4 cm) screen and capable of monitoring up to 8 sensors. 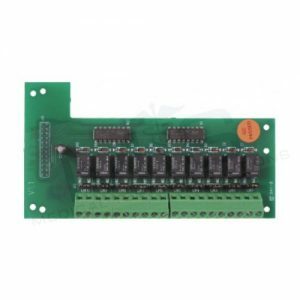 Sensors shall be mounted locally (in the rough-in box) by installing the copper pipe provided or mounted remotely. 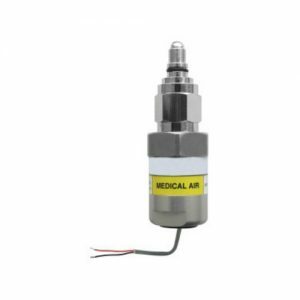 Sensors will be automated for gas specific detection. 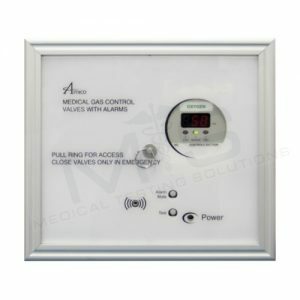 Each sensor unit is gas specific, with an error message display for an incorrect connection. 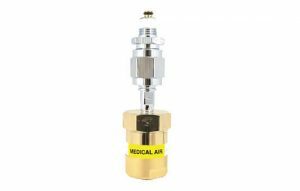 Each gas service shall be provided with a digital read-out comprising of 0-249 psi (0-1,717 kPa) for pressure and 0-30″Hg (-100-0 kPa) for vacuum. 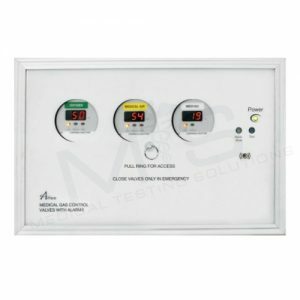 The digital read-out shall provide a constant indication of each gas being measured, indicating a green “NORMAL” and a red “HIGH” or “LOW” alarm condition. The default set-points shall be +/- 20% variation from normal condition. 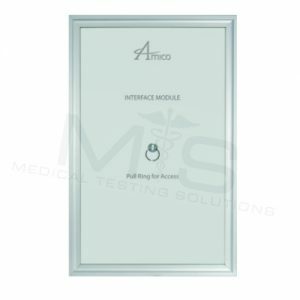 In the calibration mode, High/Low set points shall be adjustable by Setup button and selecting set points with up and down buttons. 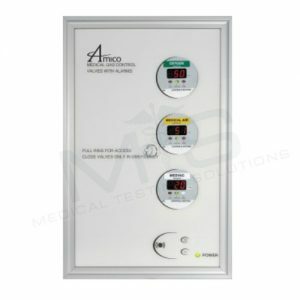 To view the set points, press and hold the mute button for twenty (20) seconds. The box shall be fabricated from 18 gauge (1.3 mm) steel with a 3/8″ (9.53 mm) O.D. type “K” copper pipe for connection to the service line. The box mounting brackets shall be adjustable to accommodate for different wall thickness. 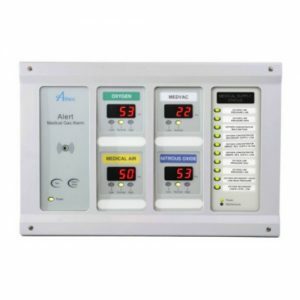 Input power to the Amico Alert-4 Series LCD Ethernet Area Alarm is: 115-220 VAC, 50-60 HZ. 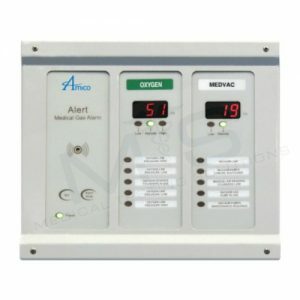 The Amico Alert-4 Series LCD Area Alarm is Ethernet ready, for use with Internet Explorer and Google Chrome.